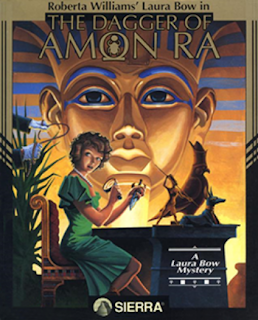 Roberta Williams' Laura Bow in The Dagger of Amon Ra was the second and final Laura Bow mystery adventure game. In this game, Laura must discover who is killing all of the people at an Egyptian exhibit in New York City. The Dagger of Amon Ra is now supported by ScummVM, a program designed to let 2D adventure games run on multiple platforms. With ScummVM, The Dagger of Amon Ra now runs on modern versions of windows, as well as Linux, Mac OS X, and many consoles such as Dreamcast, Wii, PlayStation 2, and PlayStation Portable. For a complete list of platforms supported by ScummVM, see here.